Bridal gowns and pagan rites: The wedding is a rite of passage a status-shift from child to adult and most western wedding traditions have their origins in Ancient Rome. The wedding ring on the third finger of a girl's left hand symbolized engagement. At the ceremony, the bride wore white robes as a tribute to Hymen, the god of marriage and fertility and was accompanied by her bridesmaid. 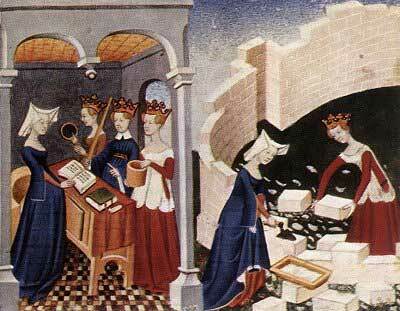 Medieval weddings were mostly arranged and among the nobility, they were more politics than love. The bride's appearance reflected directly on her family, so her ensemble was of rich colours and expensive garments of furs, velvet and silk, no expense spared. Peasant brides on the other hand wore gowns in greens or blues dyed with woad. For the lower classes, the wedding was still a high occasion and they dressed as formally as money allowed. Humbler fabrics were used, but styles of the nobility were copied as much as possible. 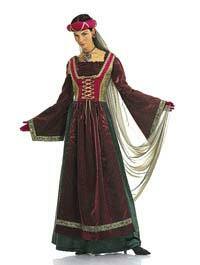 In the 1300's the traditional wedding gown was the cotehardie or 'bold coat'. It was a close-fitting garment, laced in back or front, with long, tight sleeves, and a full slit in front to show the underdress, which also carried a train. They were made with silk brocades and worn with a gold belt encrusted with jewels. The bride wore a ring representing eternal vows and true love; a brooch as token of her chastity; and a garland worn over loose, flowing hair for virtue. Although bridal white is relatively new, there were historical precedents. Henry IV of England's daughter, Princess Phillipa, wore a tunic and mantle of white satin, edged with velvet and ermine, at her marriage in 1406. Anne of Brittany wore white at her marriage in 1499 while in 1527, Marguerite of Valois married in white ermine and covered by a blue coat with a five-foot train. When Elizabeth of Bohemia married in 1613, she and her maids were robed in white and silver tissue trimmed with silver lace. Her train of silver and sleeves, encrusted with diamonds cost her father James I of England and Scotland a fortune. She wore her hair loose, hanging to her waist, with a crown of gold. 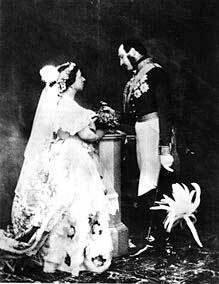 In 1840, Queen Victoria married Prince Albert of Saxe-Coburg and wore a relatively plain white satin gown adorned with orange blossom wreath headdress with lace veil and eighteen foot train, carried over her arm. The official wedding photo was published around the world and the white wedding gown became the rage with high-society brides. Her daughter, Princess Alice - and also Alexandra, Princess of Wales - married in white dresses with orange blossom wreath headdresses in 1858 and 1863 respectively, continuing the precedent set by Victoria. Prior to her reign (1837-1901), most brides wore current fashions and colors, including cream and ivory. These gowns were simple in design and not heavily embellished. Often, the veil was the most elaborate part of the wedding attire. Blue was still considered the symbol of purity and many women wore blue wedding gowns for that reason. Victoria's wedding changed all that and for the rest of the century, white continued to gain popularity. By the 1880's most women wore soft whites and ivories and the white wedding gown came to symbolize purity and innocence. Later attribution suggested white symbolized virginity. For many working class brides, marrying in a lavish white gown you would never wear again because of its style and color, was an extravagance they could neither afford nor justify. Without modern conveniences, cleaning a pure white dress that elaborate was next to impossible, so many continued to wed in gowns of soft blues, greens soft ivories and even black (if they were marrying a widower). Bonnets and veils were worn according to the style of the day. It wasn't until the end of the 1860's, that veils were worn over the face. The Industrial Revolution brought about change. The arrival of the department store meant a much greater accessibility of fabrics and designs for women who could now realize their dream of being married in a 'new' wedding dress. Prices came down and the white dress was no longer the preserve of the very wealthy. By 1890, it was accepted that a wedding gown be white. The Edwardian period brought a greater extravagance to bridal fashion. Wedding gowns were further embellished with lace and pearls. This continued to the outbreak of WWI, when styles became simpler and reflected the changing role of women in society. Hemlines rose and tightly laced corsets disappeared. Wedding gown styles continued to follow the fashion trends of the day, including the short flapper dress popular in the 1920's and the fashions of the early 1930's. The influence of the movies with glamorous evening gowns also influenced wedding dress design. When the Depression hit, brides made do with their 'best' dress for the wedding. 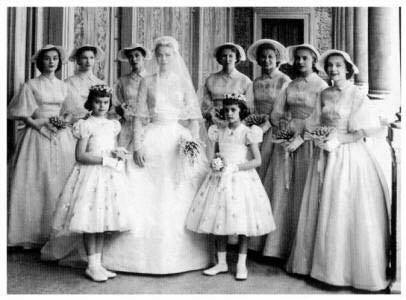 Many brides dyed their white wedding dress after the wedding, keeping only the collar and cuffs white, a common practice at that time. In 1956, watched by over 30 million television viewers, Grace Kelly's marriage to Prince Rainier of Monaco was hailed the wedding of the century. Her wedding gown was a white high-necked, long-sleeved gown with fitted torso and billowing skirt made of twenty-five yards of silk taffeta, one hundred yards of silk net, peau de soie, tulle and Brussels rose point lace. She wore a Juliet cap decorated with seed pearls, orange blossoms, and a veil of 90 yards of tulle. Like Queen Victoria's wedding before her, Princess Grace's wedding set the trend for the next decade and big white wedding dresses were in. These vintage inspired wedding dresses of the fifties and sixties gave way to more relaxed gowns in the less formal weddings of the seventies. Outdoor settings replaced churches, garlands of daisies replaced veils, and the couples wrote their own vows. 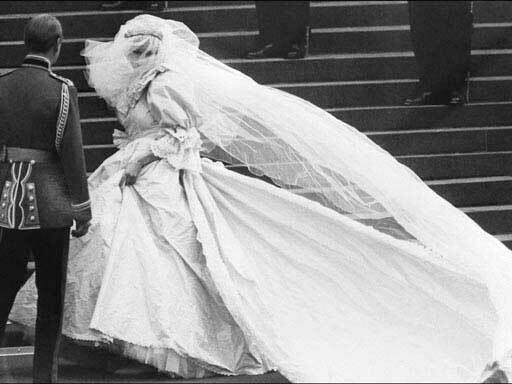 In 1982, Lady Diana Spencer's wedding to Prince Charles was another grand fairy-tale wedding complete with a grand white Victorian-styled dress. It was puff-sleeved with a fitted bodice and full-skirted of ivory taffeta. Like many fashions of the 1980's there was little understatement with it. It was grand. The nineties saw a return to sleeker, less complicated styles. The all-pervasiveness of television as well as the almost universal access through the internet, means the 21st century bride can dress in almost any style - from ornate designer dresses to a something informal. The colour of the wedding gown still mostly white, eggshell, ecru and ivory, though, coloured wedding gowns are making a comeback. The white wedding gown is more tradition than virtue, though even these traditions are blurring with the rise of the global community. With women marrying later and becoming more independent, the 21st century bride is eclectically assuming her own custom look and feel.